You don’t have to starve yourself to lose weight! Chances are, you just need to cut down on the number of calories you are taking in. Consider this: you can lose a pound a week by trimming 500 calories each day. Find out more from this no-nonsense guide. Look around - there is an obesity epidemic in America. Right now, there are more people overweight than ever before. One of the best things you can do for your health is to lose weight and maintain a healthy weight. If you start by cutting down just 500 calories each day, you can lose around five pounds a month. Before you know it, your body will be ‘bathing suit ready’ in no time. 10. Cut out the cocktails. Sour mix, syrups, creamy additions, and sugary fruit juices all turn drinks into desserts. Instead of choosing these types of cocktails, try those mixed with tonic water, club soda, cranberry juice, or a squeeze of citrus. You will save over 600 calories this way. 11. Avoid eating too much of the ‘whites’. White foods are usually loaded with calories and carbs and low on nutrition and fiber. These foods include pasta, rice, potatoes, bread, and sugar. Go for the whole-grain options and pick meals with more meat and vegetables to save yourself 500 calories. 12. You don’t have to clean your plate. Experts agree that if you leave a mere 20% of food on your plate at every meal, you will cut as many as 500 calories. The idea is, when you’re full, you’re done. It’s that simple. 13. Go for the ‘mini’. If you are looking to dodge calories, check out the menu for small versions of tasty desserts. By choosing the smallest version, you will cut out a great deal of calories each day and maintain a healthy weight. 14. Substitute fresh fruit for smoothies. 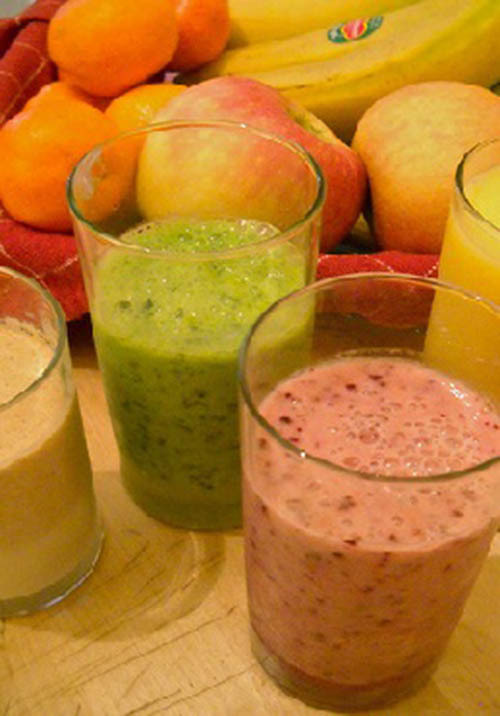 A 32-ounce smoothie can have as many as 800 calories. Instead of mixing up one of these, eat an apple or a banana. You will get full and get healthy at the same time. 15. Be on the lookout for hidden oils. Instead of cooking your food with oil, go for poached, steamed, baked, or broiled versions. By cutting out oils, you will save on calories and eat heart healthy to boot. 16. Make a smart trade. Consider this: if you trade from your bagel to an English muffin, you cut out 230 calories. And if you swap a glass of whole milk for skim, you save 70 calories. If you avoid a three-egg omelet and instead have two egg whites, you cut 200 calories. Add all that together and you’ve just omitted 500 calories from your daily intake. 17. Make smarter meal choices when eating out. Instead of mayonnaise, use hummus or mustard. Instead of a large roll, eat a piece of whole wheat toast. Go for a salad on the side instead of fries. By making smarter choices, you can cut out lots of calories from your daily intake. Researchers tell us that by drinking around 40 ounces of water each day actually boost metabolism so you can burn more calories. What’s more, water fills you up and you don’t get as hungry with your meals. 19. Chew your food well. One of the easiest ways to slash calories is to eat slower and chew up your food. According the American Journal of Clinical Nutrition, women who chew at least 20 times before swallowing eat around 100 calories less during meals. 20. Slim down your sides. Many people don’t realize that their side dishes are loaded with calories. Instead of chips with creamy dip, try baked tortilla chips. Trade in that side of potato salad for some sliced cucumbers and tomatoes. You can trim off 500 calories each day just by choosing low-fat, low-calorie side dishes. Which diet is good for diabetic patient?